Who knew you could actually knit without needles? Put down those complicated knitting projects that take forever to finish. Knitting Without Needles brings cool home, gifts, and clothing accessories--cowls, totes, rugs, poufs, scarves, and more--within arm’s reach. 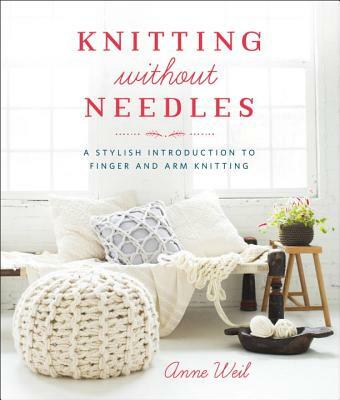 An all-in-one resource for a new kind of craft, this book shows you how to loop yarn with your fingers or your forearms with thirty patterns that are simple to follow and produce stylish results. Best of all, many of them knit up fast—in less than an hour! Even if you’ve never picked up knitting needles, you can easily master the techniques to make fun knits with kids and for kids (a princess crown, baby booties) and even last-minute gifts (a statement necklace for your fashionista friend). With stunning photography, plenty of step-by-step photos, and a detailed resource section, Knitting Without Needles is your go-to for a new way to knit. Anne Weil is the creator of the DIY blog Flax & Twine and a designer of craft, knit, and crochet patterns that have been published on sites such as Design*Sponge, Design Mom, Apartment Therapy, and the Huffington Post. She is also a member of Martha Stewart’s small team of craft freelancers, producing monthly projects for the brand. Anne teaches knitting classes nationwide at art retreats, local yarn stores, and online at Creativebug.com and Craftsy.com.